When Knez Homes broke ground last spring on the first phase of Breakwater Bluffs (high-end townhomes on the shores of Lake Erie at W. 58th Street and Breakwater Boulevard), the Gordon Square Arts District was just coming into the spotlight as one of Cleveland’s hot new redeveloped neighborhoods. 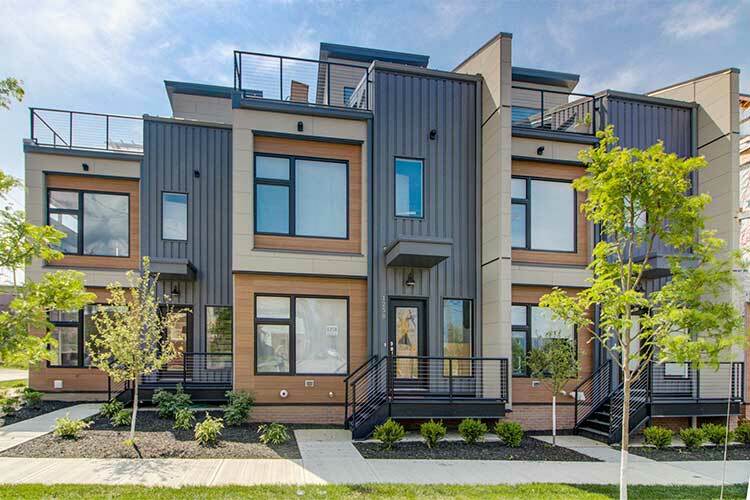 A little more than a year after construction began, Breakwater Bluffs completed phase one about two months ago—featuring five traditional homes (known as The Bluffs) and nine townhomes (known as Skyline). According to Bo Knez, the first homeowners began moving in at the end of 2017; all of the traditional homes have now sold, and all but two of the Skyline townhome units have sold. Phase two’s Vista units have two bedrooms and a bonus room; range between 2,139 and 2,189 square feet; and include a deck. Knez says the three-story homes will sell in the low $400,000 range. All units in the development feature Energy Star-rated stainless steel appliances, two car garages, and a 15-year tax abatement. Knez says Breakwater Bluffs’ many amenities in the $10 million project have drawn homeowners to the area, as well as the neighborhood’s ever-growing offerings in thriving Detroit Shoreway and Gordon Square.